Eisenberg was the most colorful of the American players. His nickname was Broadway Billy . . . . Much of the time he was living it up in Hugh Hefner's mansion, or playing backgammon against such unmystical people as Constantine Platisis (the Greek shipping millionaire), Polly Bergen, Diana Ross, Paul Newman, Susanne Pleshette, Hank Greenberg, Jill St. John, Billy Gordy (Motown Records), Prince Alexis Obolensky, and John Huston. But what about the supreme backgammon gamesman behind the legend, the seasoned competitor who plays to winand most of the time does win? We spoke to Eisenberg recently and what we found was a bit surprisingsurprising because he was mostly sober, sensible, and on the money. In 1942, when Eisenberg was seven years old, his great aunt taught him 500 Rummy and unwittingly started him on his gradual ascent to the big time in table games. He learned bridge at Hofstra on Long Island and, at the age of twenty-three, backgammon at the Manhasset Bridge Club. The rest, of course, is history. 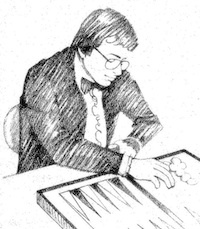 His experience in the 1975 World Championship, a Vegas backgammon tournament, suggested to Eisenberg that there was something indefinable about the game. After an early lead in the semifinals match against Norman Zadeh, Eisenberg lost a game he figured he'd win with a gammonthe cube had reached 4. Eisenberg describes the situation with some incredulity: "Zadeh was bearing off. We got down to the classic position where I had a man on the ace point and he had three men on his deuce point. I was running out of time and was unable to move any other pieces around. Sure enough, Zadeh rolled a number with a one which left two blots. Then I rolled double aces from the bar." Eisenberg went on to win the tournament. Eisenberg suspects it was more than just luck: since the quarter-finals, some people had been predicting his win. In the match with Zadeh, in fact, several friends predicted he would win by throwing double aces. "It was all too much a coincidence to be a coincidence," says Eisenberg six years later. How then does he explain a perfect roll at that critical moment? "The will to win," Eisenberg explains cautiously, "sometimes seems to produce results for people. I don't claim to understand it or control it, but there are peak moments when I have a sense I know what's going to happen." Hardly an empiricist's approach to the game. We asked Eisenberg what has changed the most since he started playing backgammon. "An enormous number of very competent people enter in tournaments these days. In the past, you could count the good players on your fingers. The big money tournaments especially have caused an increase in the level of skill. Because people have the opportunity to win and lose a lot of money, they're studying recorded matches and other information. They're making an effort." Eisenberg is also regarded by tournament players and promoters as one of the shrewdest arbitrators on the floor. As most experienced players know, making tournament rulings involves more than just reconstructing the game and using common sense; it requires a special delicacy and tact which most players agree Billy Eisenberg has. "A good rulings maker," says Eisenberg, "shouldn't get too involved in his own authority, or people will lose a sense of his humanness." "The most difficult task," Eisenberg continues, "is making the presentation of your ruling to the side that isn't happy. You must use a little bit of thought, diplomacy, and sensitivity to their injury. Most people, at least, want the recognition that someone cared a little." Rulings are easier when disputes are legitimate, and Eisenberg believes that most tournament players are honest. "Among experienced players there is a minimum amount of cheating in backgammon. After all it isn't easy to cheat when everything is, literally, above board. Bridge, though, is a much trickier proposition." As an expert in both bridge and backgammon, Eisenberg has a keen sense of their similarities and differences. He explains that backgammon is more intuitive and less analytical than bridge. "In backgammon there is a limited amount of knowledge which is numerical, but the game does not have any ultimate solution. The kind of problem solving in the two games is different. Bridge is deduction; it's like uncovering a detective story. As the bidding and then later the play unfold, you keep getting new information. With that new information, you keep changing your decisions to try to learn what's happening, to uncover layers. In backgammon, the big picture keeps changing. The picture you had a minute ago has no more relevance now. That's why it's intuitive." Both games share something Eisenberg hopes will change: Americans don't seem to appreciate them as much as Europeans. "In Europe, both games have more snob appeal than they do here, backgammon especially," Eisenberg observes. "In Europe, it's the jet set game." Unlike its more fickle American counterpart, the European jet set has remained enthusiastic for backgammon. Since early 1970, Eisenberg stopped playing backgammon full-time and now works as a stock broker in Los Angeles. Today he enters only about five backgammon and three bridge tournaments a year, often with little preparation: just ten days before the tournament he will play three hours a day and study some game strategy. What have we added to the Billy Eisenberg legend? Only that the man is articulate, perceptive, and human. And that, we hope, is part of what makes an honest-to-goodness champion. "There's a large amount of luck and skill in backgammon. I don't know how much there is of each, but I do know that the longer you play, the more likely it is the better player will win. Between a good and a bad player, a 30 to 35 point match would show who the better player was 99% of the time. If the players had more similar skills, then maybe they would need to play a 100 or 150 point match, and even then you wouldn't know. But in over 2,000 games the more skillful player would be ahead over 99% of the time." "All players recognize the importance of establishing an advanced anchor in their opponent's board; everyone tells you to make your opponent's five point. The biggest mistake beginners make is to leave the five point prematurely. A second big mistake beginners make is using the cube prematurely. When to double and when to pass is the most important decision in the game, and beginners don't devote enough attention to it." "My trademark at tournaments, when I get very nervous, is that I chew gum, smoke cigarettes, and drink water all at the same time." "When people play for money, they take greater risks. If you offer them the cube and there's only a one in four chance of winning, they will take it. In tournament backgammon, the better player tends not to take the cube even at three-to-one shots. Overall the cube has more threatening overtones and it's used more conservatively. The experienced tournament players don't want to see the cube up to sixteen." "If someone is trying to psych you out during a tournament, my advice is that you should first recognize that you don't have to be a victim; you're the master of your own destiny. If somebody is bothering you, and you show them that it's affecting you, then you are going to lose. You have to overcome it. If the intimidation is really bad, go to the tournament directors and complain." "People who trade in commodities or securities have a certain ability at numerical games. A trader would undoubtedly find backgammon an attractive game, a game he would learn quickly."